During a visit last December to St Francis Xavier Home for the Elderly in Cheras, run by The Little Sisters of the Poor, I sighted some lovely butterfly species flying around, intoxicated by the Lantana blooms that were showing off like crazy in the Home’s compound! Of course, I became as dizzy chasing them around to capture some shots, selectively of those that weren’t yet in our butterfly photo gallery. One was the African Queen or Plain Tiger, a fast-flying butterfly while the other, Tawny Coster, a sluggish flier that was easily photographed. Thanks to Autumn Belle’s post of a similar butterfly laying eggs, featured at MyNiceGarden that gave a clue to its identity. Not a very colourful tropical butterfly but attractive all the same. Just researched and found out that my featured flier here is a female species. 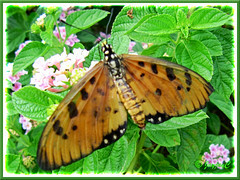 Tawny Coster butterfly is a medium-sized butterfly with a wing span between 53-64 mm wide and tawny-coloured as its common name imply. Nevertheless, the adult males are more striking, being brightly coloured in brick-red or brownish-orange while the females are much paler or duller. Nature has patterned them well…their Creator, the matchless divine designer has endowed them with distinctive black and white spots, markings and bands that contrast beautifully with their ground-colour and strategically placed to showcase their appeal! 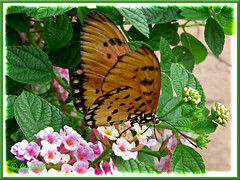 Acraea terpsicore or A. violae, the latter name being more popularly used, has rounded wing apices and fore wings that are elongated tipwards as characteristic of the Heliconiinae, commonly called Heliconians or Longwings, a subfamily of the Brush-footed butterflies (Nymphalidae). 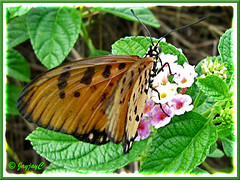 It is a slow and weak flier, frequenting flowers such as Lantana, Land Caltrops and Monk’s Pepper. Unpalatable to birds and predators alike as when attacked or handled it exudes a smelly yellow and oily liquid in defence. Do check out at wikipedia for in-depth information on Tawny Coster and be astounded by its photo gallery that included the life cycle images too. Distribution range: Originated from India and Sri Lanka, and distributed to Myanmar, Thailand, Peninsula Malaysia, Singapore and downwards to the Indonesian Islands. Habitat: Fairly open forest, secondary growth, grassland, gardens, etc. and predominant during the monsoon periods. It’s usually seen at low elevations though has been recorded at heights of up to 2,100 m in India. Hostplant(s): The larvae feed on plants of the Passifloraceae (eg. Passiflora foetida or commonly known as Stinking Passionfruit), Cucurbitaceae and Loganiaceae.